ROBERTO ROSA KNEELS THREE STORIES ABOVE THE GROUND on scaffolding outside the Yarmouth New Church in Yarmouth Port. Oblivious to the height and the chilly spring weather, Rosa grabs a stained-glass window roughly the size of a small ironing board and positions it inside a window frame. He uses his hands to hold the glass in place as he looks at the possible fit. He continues looking until, suddenly, he brings the piece down, grabs a utility knife and shaves a thin layer of lead from the window's sheathing in one continuous motion. 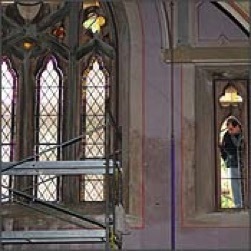 Rosa places the stained glass back in the window frame and begins again. No, this is obviously not Roberto Rosa's first job, which is precisely why the Yarmouth New Church Preservation Foundation hired his company, Serpentino Stained and Leaded Glass of Needham, to restore the original stained glass at the former Swedenborgian Church on Route 6A. Together with Westmill Preservation, the company charged with restoring the walls and woodwork of the church, Rosa and fellow specialists are honoring the skills of the building's original craftsmen by leaving as much of their original work as possible. craftsmen painstakingly restored the panels to their original beauty, replacing the original glass only when absolutely necessary. "Every project is a little different," says Rosa, who explains that Serpentino specializes in just such restoration projects. Indeed, the company's experience is impressive, having handled restoration jobs at the Massachusetts State House, the Princeton University Chapel, Trinity Church in Boston and the Mother Church of the First Church of Christ, Scientist, also in Boston. Inside the church, designed by Samuel J.F. Thayer and built in 1870, the emphasis is also on preserving history. "This paint, I believe, is original," says Mason Cook, owner of Westmill Preservation, as he points to a section of the interior wall. As a result, workers are not ripping down walls and starting from scratch; instead, they're drilling small holes in the existing plaster and injecting caulk through the hole. The procedure takes more time but ensures that the original wall, along with its original paint job, is repaired but not significantly altered. "The main point is that it won't get any worse," says Cook, who adds that any new plaster to replace broken sections of wall would be matched to the existing wall as much as possible. "We're making sure that we're not losing any of the original." Walter Chapin, president of the Yarmouth New Church Preservation Fund, a non-profit group which has been working since 1998 to restore the historic building, says he is very pleased with both restoration efforts. He says the current projects, combined with an earlier one which successfully repaired the church's massive steeple, show the group is on the right track. "If it wasn't meant to be, we wouldn't be able to move forward like we have," says Chapin. "We keep putting one foot in front of the other." The goal of the restoration, Chapin says, is to make the building a vibrant center for community activities. Even now, he says, the site is used for cultural events such as plays, concerts and organ recitals. The church boasts an original Tracker organ and excellent acoustics. Future restoration efforts include major roof repairs and improvements to the building's handicapped accessibility. "The community has been very supportive," says Chapin, who adds that residents and businesses wishing to contribute should mail their donations to: The Yarmouth New Church Preservation Fund, P.O. Box 237, Yarmouth Port, MA 02675. Also known as the Church of the New Jerusalem, the Gothic-style church has been used only seasonally for services since the 1920s.